Dr. Michael Toole, dean of the UT College of Engineering, has been named to the DriveOhio Government Advisory Board. He was appointed to the seven-member board by outgoing Gov. John Kasich. DriveOhio is an initiative in the Ohio Department of Transportation charged with accelerating smart vehicle and connected vehicle projects in the state. 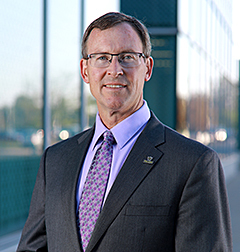 “It is an honor to serve on this board and represent The University of Toledo,” Toole said. Toole, who was named dean of the UT College of Engineering in 2017, received a PhD in technology strategy from the Massachusetts Institute of Technology and has focused his research on innovation in design, construction and infrastructure. He is a professional engineer and a Fellow in the American Society of Civil Engineers. During the past year, the UT College of Engineering has offered a five-part series on autonomous vehicles in partnership with AAA of Northwestern Ohio, Toledo Area Regional Transit Authority, Toledo Metropolitan Area Council of Governments, DGL Consulting Engineers LLC and Path Master Inc.
“The UT College of Engineering’s participation in this series has given me a strong appreciation for the important research being conducted at the University on related research topics such as cybersecurity, distributed networks, connected infrastructure, advanced materials and mechatronics,” Toole said. DriveOhio’s mission is to serve as the state’s central hub for smart mobility — the use of technology to move people and goods from one place to another as effectively as possible. The government organization is a single point of contact for policymakers, agencies, researchers and private companies to work together on smart transportation. This entry was posted on Friday, February 15th, 2019 at 3:51 am and is filed under Engineering, News, UToday .